Need a banner? Do you know what type of banner you need? Do you know how to make an EFFECTIVE banner that will advertise your business and bring you customers? 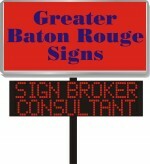 At Greater Baton Rouge Signs, we help you by providing answers to these questions. We always come to your place of business and save you time. We make things so convenient for you that you don’t need to do anything. We place your order for you, pick up the completed banner(s), and deliver it to your doorstep. If installation is a problem, then we arrange for installation. We make sure that we save more of your time, because we believe that TIME IS MONEY! To create banners, Greater Baton Rouge Signs uses advanced computer equipment onsite. These highly equipped machines allow us to create better layout of your banner design(s). Our people possess extensive knowledge and experience in the field of advertising. These are the people who will be making important decisions to maximize the effectiveness of your banner(s). Do you have a logo or layout that “brands” your business? With the help of our extremely creative team, we can produce one for you. 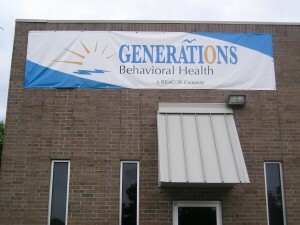 Greater Baton Rouge Signs ensures that you get the RIGHT banner for your needs. We purchase signs and banners at wholesale prices, and these discounted savings are passed on to you, as we have very little overhead. We supply banners that are cheaper than any other Baton Rouge or New Orleans area sign maker. DON’T OVERLOOK QUALITY, DURABILITY, AND EFFECTIVENESS – It will cost you!! !